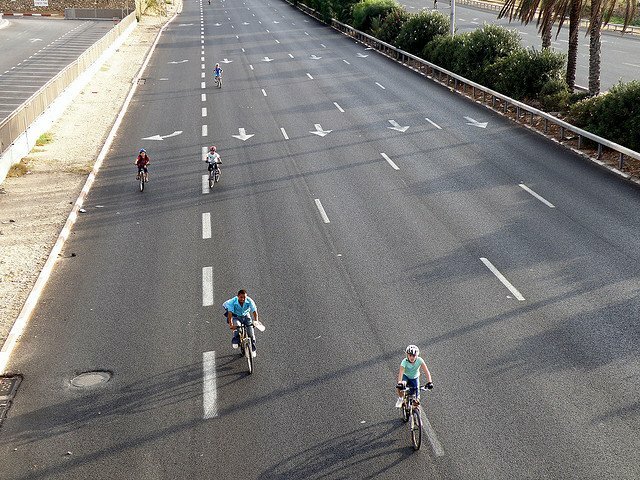 When you look for images on the Internet for Yom Kippur in Israel - you will either see photos of empty highways, cycling children or masses of praying religious Jews dressed in white. And yes, I guess that what a lot of people experience during Yom Kippur. But it so much more than that. Yom Kippur is the day of Atonement and one can say that the entire previous year leads up to this single day. In the days following up to Yom Kippur, Jews are supposed to reflect over the previous year, look at what they have done wrong and set it right. Family and friends are asked for forgiveness for any hurts that you may have caused them, grudges are finally put away and everyone tries to enter to new year with a clean a slate as possible. According to Jewish tradition, God's writes down each person's destiny for the new year during Rosh haShanah. At Yom Kippur the verdict is finally closed and sealed. Just before and after Yom Kippur people wish each other a "G'mar Chatima tova" or a 'good final verdict'. The day of Yom Kippur itself is spend by fasting for 25 hours (no food or water) and many people attend synagogue. For many Israeli Jews, Yom Kippur is the only day of the year that they do go to the synagogue. The country also comes to a total standstill, the television stations are closed, the borders, restaurants and shops are closed. The entire country becomes a ghost town. Many people do not use any form of electricity. No computers and no telephones. Of course not everyone is religious and may watch DVDs or cable TV quietly in their own homes. But still, the entire country is quiet. Nobody but nobody drives their car. On Yom Kippur the roads and highways belong to the ambulance drivers and the children on their bicycles. It is not easy to fast for 25 hours, to not take a bath and to stay away from electrical appliances. But it is wonderful to sleep for as long as you like without traffic waking you up, to chat quietly to neighbors in empty streets and to have some time to just think.